Owned by China’s Qiangjiang for over a decade, the long-awaited revival of Italy’s oldest existing motorcycle brand is well under way. With a plethora of new models unveiled back at EICMA 2017, Qianjiang/Benelli is leading the charge of Chinese manufacturers making strides in the European market. 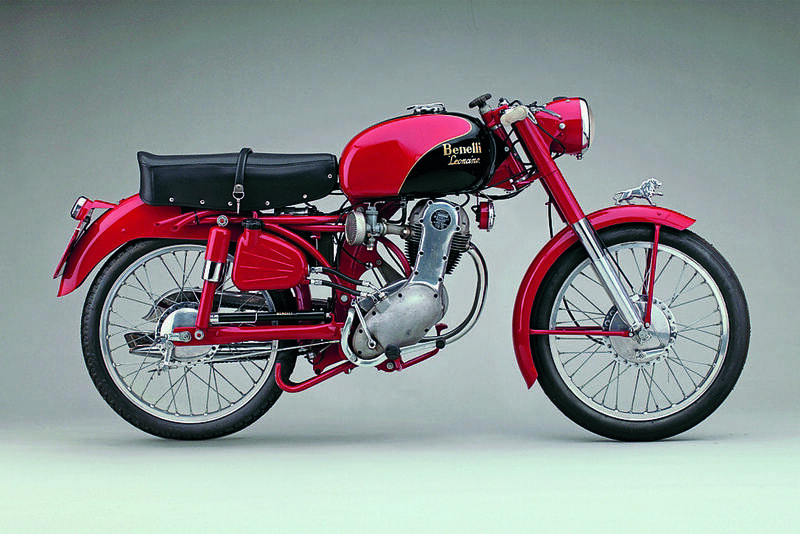 Back in 1951, Benelli launched its original Leoncino 125cc; one of the most popular machines in the iconic Italian brand’s illustrious 106-year history, with 50,000 built between 1951 and 1972 – and for 2017, an all-new Leoncino 500 has made it to market. We travelled out to Italy for the Leoncino launch, and took the chance to put one through its paces in the hills above Rimini. Hot on the heels of the parallel-twin Benelli TRK502 adventure tourer, Benelli has launched its latest incarnation of its iconic Leoncino. 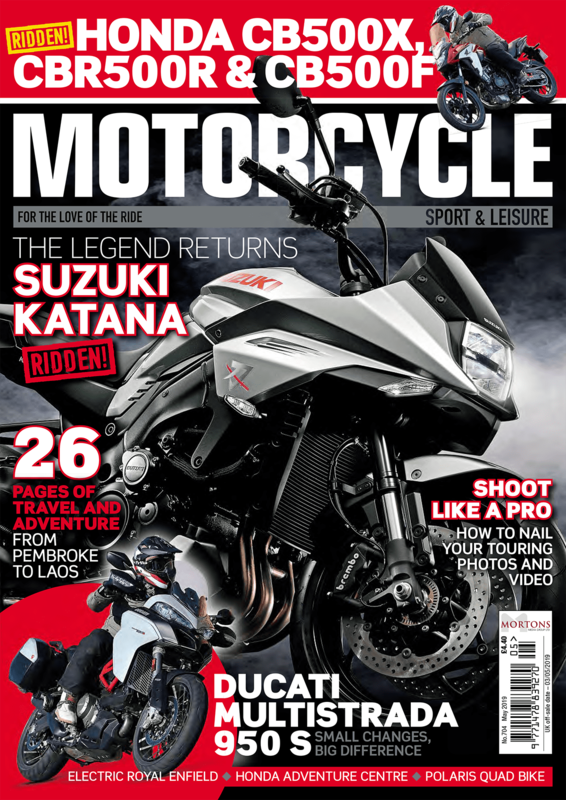 To keep up to date with and everything Motorcycle Sport and Leisure, like our Facebook page or subscribe to our monthly magazine online! In short, it’s a naked roadster which matches neo-retro styling with modern technology – while sharing much with its TRK502 sibling. Interestingly, its standard Pirelli Angel ST tyres, Bosch ECU and two-channel ABS, are the only bought-in items for the Leoncino. QJ and Benelli look after everything else in-house, which includes the brakes and suspension. My first impressions basedon appearance alone were overwhelmingly positive. It’s a fantastic looking machine, thanks to the hard work of Benelli’s new CentroStile Italian design centre which has reimagined the original Leoncino, delivering an uncomplicated modern motorcycle, that’s great fun to ride too. A lovely design touch is the little lion (Leoncino translates to Lion Cub), which sits on the front fender, linking the new machine to the original Leoncino. Features include a digital dash, which incorporates an analogue tachometer and digital speedo, and offers water temp, fuel gauge, clock, mileage, trip and gear information. Its lights are all LED and it comes with an Italian made leather seat (which is very comfortable, by the way) which is set at 815mm, delivering a surprisingly spacious riding position for my 6ft 1in frame – and I have no doubt that shorter riders would find the Leoncino just as comfortable too. It weighs in at a fairly average 196kg, but it’s really well balanced so you’ll barely notice the weight once you’re in the saddle. The Leoncino features fairly wide ‘Benelli Piega Bassa’ (‘low lean-over’) taper-section handlebars; in practice, they helped to provide excellent leverage for flicking the bike from side to side through the tight switchback we encountered on our test ride. The mirrors on the Leoncino are well designed too, providing an excellent rear view with no vibration – and its slimline 13.2-litre fuel tank offers a claimed 300km range. Admittedly, there are no indents for your knees, but it’s easy enough to grip regardless. The Leoncino’s 500cc parallel-twin engine is near on identical to the TRK502’s – the only real differences are the exhaust system, airbox and engine mapping, which help to increase performance, while meeting Euro 4 regulations. The Leoncino’s engine is smooth yet torquey, but with more grunt than its TRK sibling – putting out 48bhp at 8500rpm, with 34lb-ft of torque at 6000 revs. Admittedly, it is 28kg lighter than the TRK, so you’d probably be a little disappointed if it didn’t have a bit more oomph. While on paper it’s not technically a powerhouse, initial pickup is fantastic. You’ll have to work it hard to find its 10,400rpm limiter – and on the tight switchbacks above Rimini, I only came close a couple of times. In truth, it feels bigger than a 500cc machine, and unlike the TRK502, you won’t have to plan miles ahead before tackling an overtake, just make the most of its smooth power delivery and easy to use gearbox and enjoy the deep resonant soundtrack that comes from its two into one exhaust as you wind the power on and sweep past traffic. For braking, the Leoncino comes with twin 320mm floating front discs gripped by radially-mounted four-pot calipers at the front, and a twin-piston caliper with a 260mm disc at the rear. In practice, they’re more than up to the job and will pull the Leoncino to a halt without much trouble. It also comes with switchable ABS, which is turned off under the seat, and turns back on when you restart the bike. 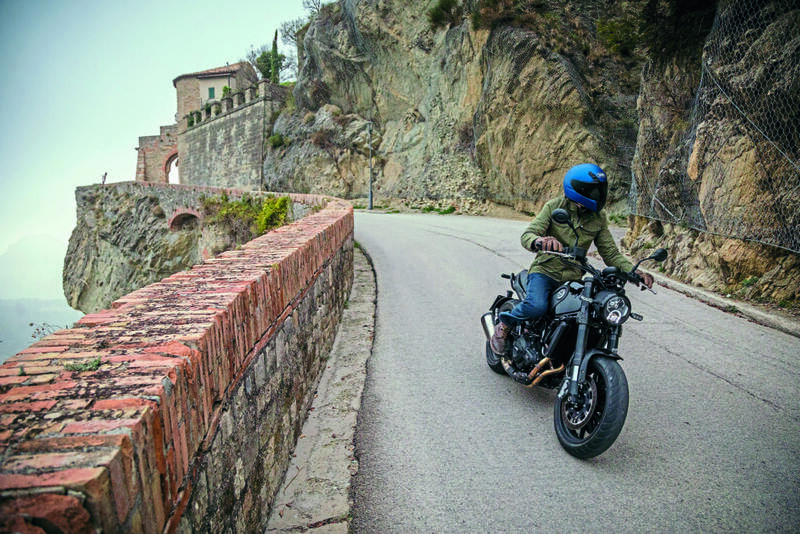 It comes with 17in Pirelli Angel ST tyres (120/70ZR17 at the front and 160/60ZR17 at the rear), which help to deliver an excellent range of grip, even on the uneven and unpredictable surfaces we encountered up in the Italian hills. Suspension-wise, the Leoncino comes with chunky 50mm upside-down adjustable forks up front and an adjustable cast aluminium swingarm carrying a cantilever monoshock at the rear. I found it soft enough to soak up the worst of the roads (which were fairly shocking), but stiff enough to inspire confidence in corners. It’s a massive step up from the TRK, which has the tendency to dive under heavy braking. 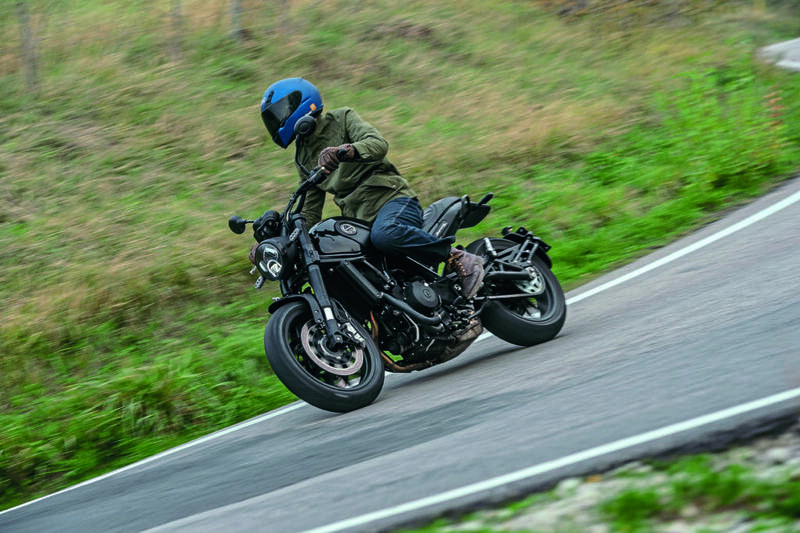 Okay, so the Benelli Leoncino sits among a plethora of new scrambler and retro-styled motorcycles – but personally, I think it really stands out from the bunch. The Benelli Leoncino 500 amounts to an affordable, accessible, everyday streetbike suitable for all kinds of riders, that looks great too – plus, Benelli has an extensive dealer network in the UK thanks to its partnership with MotoGB, so you can rest assured you’ll have ample support available should anything go awry. There are two colour options available for the 2018 Benelli Leoncino – Leoncino Red and Vulcan Black. Next Post:67 years old and 297mph!